Looking for the perfect personalized gift? 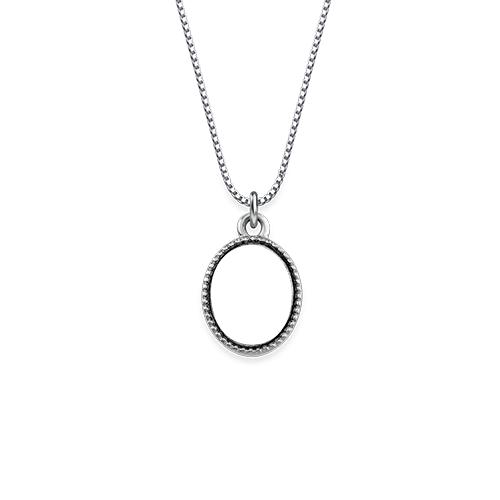 Our tiny oval photo pendant may be exactly right for mom, grandma, or anyone else on your list. It all begins when you choose a photo – perhaps of a child or grandchild, perhaps of a pet, or perhaps of a special place that means the world to her. Next, select an inscription for the back of the personalized photo necklace. Once complete, your gift will be like no other! This beautiful photo jewelry comes complete with a box chain, so she can begin enjoying it right away. See it in tiny heart shape or tiny round shape, too! Measurements: 15.16mm x 10.62mm / 0.59" x 0.41"